1. Our Earth is covered by _________ of water, but most of the water is not ________ and contains salt. 2. Nearly _______ of our body is made up of water and the rest is solid matter. 3. _____________ is a process in which there is a loss of water from plants as water vapour through the pores of their leaves. and its return to the ocean as rain, hail or snow, is called the _______ ________. 5. Water which is fit for human consumption is known as ______ water. 6. 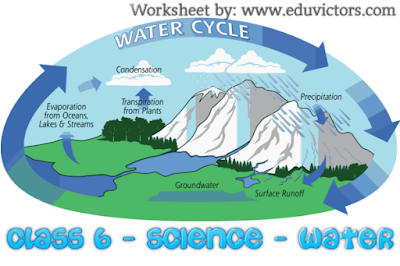 The process of conversion of water from liquid state to vapour state is called ___________. 7. ______ is the solid state of water. 8. ______ is the liquid state of water. 9. _______ is the gaseous state of water. 10. ________ occur when there are no rains for a longer period of time. 11. ______ are tiny drops of water floating in air. 12. ‘Catch water where it falls’ is the basic idea behind ________ ___________. 13. On condensation, water falls in the form of ________ and __________ . 14. Wise and judicious use of water is called ________ _____________. 15. Water vapour gets added to air by __________ and _____________.